I wanted to let readers know that my new book, Villa Fiore, may be purchased on Amazon in both the digital [ebook] and in the paperback versions. My other books, Spirited Constellations and Spirited Constellations Travels, are also available on Amazon in digital [ebook] and in paperback formats. Hear Ye! Hear Ye! A New Book! My new book Villa Fiore is now available on Amazon in a digital [e-book] format, and it is on http://www.createspace.com in a paperback version! Lorenzo “Renzo” Fiore unexpectedly inherited his family’s estate in a hillside town in Tuscany. Renzo got more than he bargained for in the form of debt, inquisitive townspeople, and an attractive newcomer to the village of Bella Fiore. Brainstorming ways to lessen the expenses of Villa Fiore results in a fresh business venture on the estate. Trials and tribulations test Renzo’s knack at balancing the various personalities and rhythms of this new lifestyle, while sexually arousing Renzo’s love as he explores the parameters of his relationship with a woman he met in the hospital. The digital [e-book] Villa Fiore is free right now in Kindle Unlimited for a limited time. Villa Fiore in paperback is competitively priced at $4.99. Feel free to write a review of Villa Fiore on Amazon! Recently I pondered the longevity of Italian cooking. While I enjoy cooking Italian food, I tend to eat other kinds of cuisine when dining out. For example, I relish Indian food. However, instead of keeping staple ingredients on hand for Indian food, I prefer not to, and opt to eat Indian out. Yet when it comes to Italian foodstuffs, I am a connoisseur due my lifelong cradle to present love affair with it. On the subject of Italian dishes, I wax poetic: as long as a cook has a bottle of high quality olive oil, fine Parmigiano Reggiano cheese, good quality pasta (I keep rigatoni, linguine, fettucine, cappellini, and rotini on hand), excellent butter such as Kerry’s Gold, and fresh parsley on hand, delicious pasta can be concocted. Additional items to have ready are Sicilian green olives (my personal favorite), Calamata olives, anchovies, sardines (both in olive oil), and panko and/or Italian bread crumbs, capers, eggs, a large tin of tomatoes, a bottle of strained tomatoes, a bottle of robust red wine such as Chianti or Pinot Noir, a bottle of dry white wine such as Pinot Grigio, white truffle butter (when in season), pesto (during the winter months I purchase Costco’s Kirkland’s Basil Pesto), pancetta or bacon, and heavy cream. With said ingredients on hand, I can whip up the following in a flash: spaghetti carbonara, pasta puttanesca, linguine with pesto, Greek pasta with olive oil, butter, and parsley, fettucine with white truffle butter and crimini mushrooms a’ la The Barefoot Contessa, spaghetti with anchovies, garlic and breadcrumbs courtesy of Melissa Clark of The New York Times Cooking, and spaghetti with sardines, capers and breadcrumbs thanks to Mark Bittman of the The New York Times Cooking. All of these delectable entrees may be made effortlessly with my pantry and refrigerator items that I generally keep on hand. All this, without my even delving into Italian soups! Here is a link to Melissa Clark’s recipe for Spaghetti with Garlicky Breadcrumbs and Anchovies recipe. I make it frequently. This Memorial Day weekend, my plans included time with my newly minted Law graduate. Whilst she is fully engaged in studying for the Bar Exam, Anjelica carved out time for an afternoon for us to kick back and catch up. We decided to explore a small bistro I had not yet been to: Good To Go by Lucrezia. One of my all time favorite places to dine is at Lucrezia Café and Restaurant in Chesterton. Good To Go by Lucrezia carries sublime artisanal olive oils and vinegars like its parent café. One of the draws for me was that Good To Go immediately reminded me of a small, tucked away café in Venice and Rome I frequented on my sojourns to Italy. The dark wood interior, faux granite countertops, bistro tables and chairs, with a bar-lined wall on one side and an oil and vinegar selections lining the other, gives a charming Italian vibe, except in Italy these dining gems use marble countertops and often tabletops as well. Good To Go by Lucrezia’s luncheon menu provided us with an eclectic assortment from which to choose. We selected the following for our leisurely luncheon: Inko’s unsweetened Blueberry ice tea; I drank the White Lemon. We ordered a Small Plate of the Bruschetta Duo with Salsa Cruda and Roasted Vegetables. It was like a riff on caponata with artisanal olive oil and balsamic vinegar. I decided on the Triple Cheese Panini with French Gruyère, Vermont Cheddar, and American cheese with onions sautéed in Balsamic vinegar, served on 13-grain whole wheat bread with butter infused EVOO. Included was a side of coleslaw, which I normally dislike, but Good To Go’s was made with oil and vinegar. Tasty. A great mug of the soup of the day, Italian Wedding Soup, was also included. For her section, Anjelica chose the Apple Artisan Flatbread made with fresh sliced apples, whole milk Mozzarella, and Amish Gorgonzola was topped with a fresh arugula and chopped walnut salad with the house walnut infused EVOO. Check out the lunch and dinner menus at http://goodtogobylucrezia.com/. The café is located at 54 W. Lincolnway, Valparaiso IN 46383; phone 219.286.7668; fax 219.286.7669; web address: goodtogobylucrezia.com. It is well worth the drive. Buon appetito! Under the gray skies of winter, when the temperature in the sub-zero range, sometimes I make calzone. I like calzone piping hot, and stuffed full of sausage, cheese, bell peppers, and marinara sauce. It makes me happy to smell the fragrant calzone, and to watch the contents surge forth onto my plate after I have cut into the bread. Oddly enough, I do not crave calzone in the summer, in the warm weather months, only during the frigid winter ones. 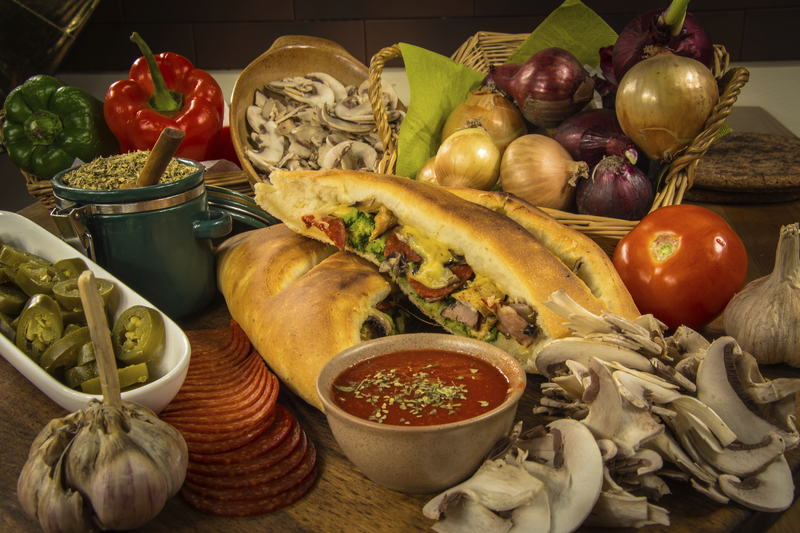 A glass of vino rosso – red wine, the ubiquitous calzone, even a small salad help sate my cold weather cravings. Take a pound of fresh or frozen bread dough, and roll it into into a circle. Drizzle with olive oil. Next, take around a pound of sausage – no casings, and brown it for about ten minutes or so, drain off the fat. Combine the sausage with one-fourth teaspoon fennel, one to two sautéed bell peppers, onions, and mushrooms tossed with red pepper flakes to taste. Add a cup of marinara sauce. Place one to two cups of shredded mozzarella or provolone on top of the dough. Be sure to leave at least a half of an inch border of dough visible. Top the dough and cheese with the sausage and sauce mixture. Scatter several tablespoons of cornmeal over a baking sheet. Place the calzone round on the baking sheet. Fold the dough over the filling, and then press the edges with one’s fingers or with a fork to seal completely. Bake the calzone for about twenty minutes or until nicely browned and puffed. Be sure to have extra heated marinara sauce on hand to add to the calzone. Grated Parmesan cheese may be sprinkled on top the warm calzone. Pour that glass of vino rosso, and start feasting on the calzone!